Fire damage at the historic Paris cathedral. Within 24 hours, the pledges had reached more than €800 million, with French business magnates and corporations jostling to outshine each other with displays of generosity. Pinault had led the pledges of donations starting on Monday night with a promise of €100 million. French corporations are eligible for a 60% tax rebate on cultural donations. The government said today that number would remain unchanged, but increased the rebate on individual donations for Notre-Dame of up to €1,000 to 75%. Bigger private donations would qualify for the standard 66% rebate. Yesterday evening, Macron set out an ambitious timeline for rebuilding the cathedral, an enduring symbol of Paris that had survived revolutions and wars throughout the ages. In a sign of the monument’s resilience, the copper rooster that topped its spire was found in the rubble from the partly collapsed roof, “battered but apparently restorable” according to a spokesperson for the culture ministry. 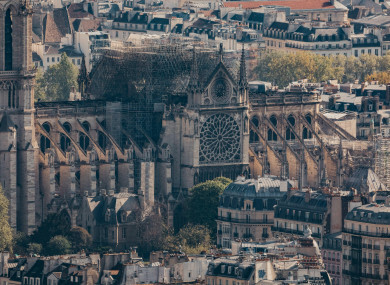 The bells of French cathedrals will sound at 18.50pm local-time (5.50pm Irish-time), exactly 48 hours after the fire started. Meanwhile, work to secure the cathedral is continuing. Junior interior minister Laurent Nunez said yesterday that although “some weaknesses” had been identified, overall the building was “holding up OK”. Email “France launches international contest to help design rebuild of Notre Dame”. Feedback on “France launches international contest to help design rebuild of Notre Dame”.